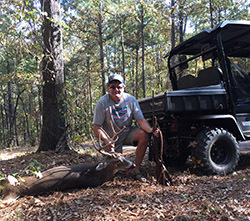 Bad Boy Off Road is part of Textron Specialized Vehicles, based in Augusta, GA. That’s where I met Ben White to pick up a Recoil IS Crew to test drive during this hunting season here at the Pig. 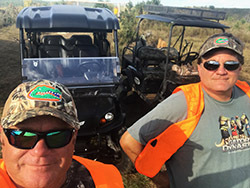 Pig partner and brother, Paul Zimmerman, and I spent some days successfully hunting last week sharing time on my old model Bad Boy Buggy and the new machine. With the Recoil we immediately noticed how awesome the suspension is. 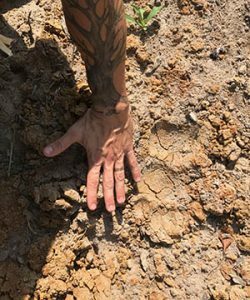 Ruts in the road? Bumpy ground off road? The Bad Boy Recoil don’t care! I’m already looking forward to my next trip to the Pig for round two since I did not get my buck. I did get meat for the freezer with a couple does. Paul, however, got a nice 9 pt. buck and Clint Underwood who was hunting with us got his first deer ever. I’m here to tell you that the battery operated Recoil is silent and that means a lot when getting you your stand. I know we have a lot of hunters in the AgWired Community so you might want to look into Bad Boy Off Road. I’ll have a more complete review of the Recoil soon but at the first test period it is getting a thumbs up from me. Well, say hello to a brand new Bad Boy Off Road Recoil IS Crew. 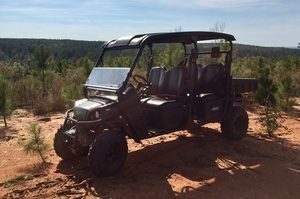 This four passenger side by side features a 72V AC drivetrain for what I like to call “silent running.” It let’s you get a lot closer to your deer stand than a gas engine. This vehicle also has 4 wheel independent suspension so we’ve got a very smooth ride on these rough roads and trails here at the Pig. That means a lot, especially after a long day in a stand and cleaning deer. Speaking of deer, my first morning in the Recoil I went to my stand and shot two does. I saw the buck I want and hope to find him in my sights next time. I put the does in the cargo space and hauled them to our cleaning stand. So, why a Bad Boy and why now? To start with, I have an old model Bad Boy from before they were acquired by Textron Specialized Vehicles. It is also out here at the Pig doing yeoman’s work moving us around. I’ve been very impressed with it and when the opportunity presented itself to test drive a new model I jumped. During this Georgia deer season I’ll be letting you know a lot more about using the Recoil in a very practical situation. I’m making notes for now and there will be much more to come. Thank you Textron and Bad Boy Off Road! Official hunt vehicle of the Crystal Pig Hunt Club this season. It is that time of the year folks. Deer hunting! An early issue we ran in to though was a couple weeks ago when we found our largest corn feeder on the ground with damage. What could have done that we wondered. The tracks tell it all. Bear. Great. It’s not bear season here and I personally would rather not meet up with Buddy Bear. We moved that feeder but put up a more secure one very close by. And it is where I put up my new Summit Viper climber stand. We missed opening weekend due to the wedding of my nephew but started this morning. Haven’t seen anything yet. We sure did setting up camp last week though. The weather here at the Pig is great. Dry, cooling off temperatures and so far, no wind to speak of.